I really love using Julia Cook's books in my classroom. They are the perfect addition to our morning meeting - especially in the beginning of the year! I created a freebie to go along with her book, Soda Pop Head. It was really useful in helping a couple of my kidlets learn to "tame their temper" as we worked through the first few weeks of school! 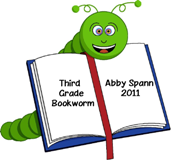 Click on over to Third Grade Bookworm if this is something you would like to try in your classroom!